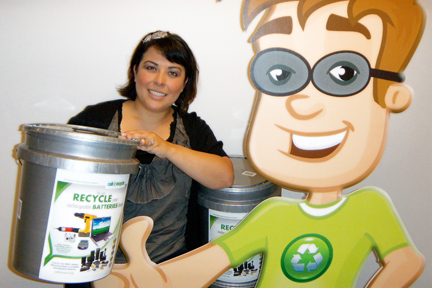 Liz and Recycling Ben invite you to look for the silver bucket at a local Convenience Center to drop off your rechargeable batteries for recycling. DALTON, GA - The Dalton-Whitfield Solid Waste Authority has partnered with Call2Recycle® to make convenient battery recycling available to residents in Whitfield County. The only free rechargeable battery collection program in North America, Call2Recycle helps communities of all sizes operate rechargeable battery collection programs. Rechargeable batteries come in all shapes and sizes. Look for the RBRC Battery Recycling Seals to identify the recyclable ones. Four Convenience Centers in the county will serve as collection sites for rechargeable batteries starting Saturday, October 15. Look for the silver bucket in the lead acid battery recycling section, or ask an attendant for assistance. (Silver bucket is pictured above.) Locations include the Household Hazardous Waste Facility at the Old Dixie Hwy. Landfill and Convenience Center location at the south end of the county; M.L. King Blvd. Convenience Center in Dalton; McGaughey Chapel Convenience Center in Cohutta; and Westside Convenience Center in Rocky Face. For specific hours of operation and directions visit www.DWSWA.org and click on Convenience Centers or call the Recycling Center at 706-278-5001. Since 1996, more than 60 million pounds of rechargeable batteries have been collected through Call2Recycle. It’s the first battery program committed to attain Basel Action Network (BAN) e-Steward qualification and upholds strict third-party standards for environmental safety and social responsibility. Learn more at www.call2recycle.org or 1.877.2.RECYCLE.